Ringworm is a contagious skin condition caused by a fungal infection and appears like a circular red rash with clearer skin in the middle. Despite its name, ringworm isn’t caused by a worm or parasite but its name comes from the distinct red raised border resembling a worm that forms around the itchy patch of skin. 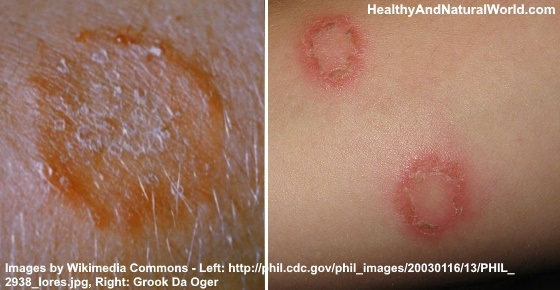 Ringworm in humans can affect people of all ages; however ringworm in kids occurs more frequently than in adults. The first symptoms of ringworm may be an itchy patch of red skin that appears scaly. Many times, red spots or raised bumps will also develop inside the red ring. Depending on the severity of the ringworm infection, more than one patch can develop, and these can sometimes overlap. Antifungal treatments are needed to kill off the infection causing ringworm. Tinea pedis. Athlete’s foot which causes itchiness between the toes. Some people may also develop tinea unguium, which is a fungal nail infection and causes thickening of the nail. Tinea cruris. Fungal infection affecting the groin area which forms reddish-brown patches of itchy. It is commonly referred to as jock itch. Tinea capitis. Fungal infection of the scalp which can also result in patches of hair loss, swollen, crusty lesions and swollen occipital lymph nodes. Tinea barbae. Red scaly patches of skin that appear around the facial beard area in men. Tinea faciei. Patches of ringworm which cause red itchy patches of skin on the cheeks, nose, chin, forehead and around the eyes. Tinea manuum. Hand fungus is a contagious skin rash that can develop on the palms of your hands, between your fingers, or back of your hands. Even though ringworm can affect most areas of the body, the root cause is the same – a fungal skin disease with symptoms of inflamed, itchy, patches of scaly skin with a distinct red border and red spots in the center. To treat ringworm quickly and effectively, doctors usually prescribe antifungal topical creams to kill the infection causing ringworm. These ointments will also help to reduce inflammation to soothe any itchy skin and lessen the appearance of redness. There are many natural home remedies for ringworm that have antifungal properties and can help to naturally get rid of the ringworm infection. Many of these natural treatments also have anti-inflammatory effect to quickly soothe itchy, inflamed patches of red skin. Garlic contains powerful antifungal properties which makes it an excellent home remedy to cure ringworm infections. Garlic contains allicin and ajoene – potent natural compounds which kill off most fungal skin infections. Mince a clove of garlic and leave it to stand for 5-10 minutes to allow the active ingredient allicin to form. Mix with a tablespoon of coconut oil, olive oil or pure aloe vera gel. Apply the garlic remedy to the skin area affected by ringworm to kill the fungi causing the infection. Leave for 20 minutes before rinsing off with warm water. Moisturize your skin with a small amount of coconut oil. Repeat 2 times a day until you no longer have any signs of ringworm on your skin. Garlic can also be used as a powerful medicine to treat other illnesses, help keep your heart healthy, and even prevent cancer. If ringworm of the scalp (tinea capitis) is causing you hair loss, applying the topical garlic home remedy to your scalp will not only help to destroy the fungus, but the garlic will also help to promote hair growth. One of the many uses of coconut oil is to apply it topically to treat various skin infections like ringworm. Virgin coconut oil is an amazing home treatment to keep your skin in great condition because of its moisturizing and antimicrobial properties. Coconut oil can be used to help treat a ringworm infection because it contains lauric acid. Research into lauric acid shows that it has antibacterial and antifungal activities against a wide range of pathogens.4 It also penetrates deep into the layers of the skin to help fight infections and keep the skin free of bacteria and fungi. You can use coconut oil directly on the affected skin to help treat ringworm and get rid of the itchy, red scaly skin. All you have to do is massage some virgin coconut oil for 2 minutes into the rash to help get rid of the infection. Repeat applying the remedy 2-3 times a day until the infection clears and you no longer have a rash with bumps. Coconut oil is so gentle on the skin and this makes it a great natural ringworm treatment for infants and kids. If you would like to make coconut oil even more effective at killing ringworm fungal infection, you can boost its potency by adding essential oils that have proven antifungal properties. Many essential oils can help make topical treatments for ringworm more effective. The 4 essential oils mentioned below have all proven to be effective in getting rid of fungal skin infections. To use these essential oils as a natural remedy for ringworm, you should add 2-3 drops of one of the oils to a tablespoon of coconut oil (or any other carrier oil) or aloe vera (see below for the aloe vera ringworm recipe). Tea tree oil. Tea tree oil is well-known for being a great antibacterial remedy to treat many skin conditions and infections such as ringworm. Its anti-inflammatory activities also help to reduce red, itchy patches of skin. Although tea tree oil can be applied undiluted to very small areas of skin (like a spot or a pimple), it shouldn’t be applied undiluted to large areas of skin. Therefore, always dilute tea tree oil with coconut oil, or other carrier oil, to help cure ringworm topically. Lavender oil. Another essential oil that has proven activities against ringworms infections is lavender essential oil. Calendula oil. Calendula oil (pot marigold) can also be added to coconut oil, or other carrier oil, to make a natural treatment for ringworm. Its soothing properties can help to reduce the urge to scratch the itchy patch of skin and it can effectively reduce redness. You can use calendula essential oil mixed with a carrier oil, or buy calendula ointment in drugstores. Apple cider vinegar (ACV) contains acetic acid which works as a natural remedy for ringworm. The acidic content of ACV can help to reduce mild to severe skin itching as well as fungal infections by lowering the pH level of the skin. Use the antifungal properties of raw unprocessed apple cider vinegar to help get rid of ringworm infections for good. Before applying apple cider vinegar on your skin, you should dilute it with equal parts of water (don’t apply undiluted ACV as it can burn your skin). Soak a cotton ball in the diluted apple cider vinegar remedy and apply to the infected areas of skin. Repeat the application 2-3 times a day until you no longer have itchy patches of skin with blister-like bumps on it. The anti fungal effect of ACV is also effective in treating yeast infections which are most commonly caused by the fungus Candida albicans. Aloe vera is a soothing natural remedy for a variety of skin conditions. You can also apply pure aloe vera directly onto patches of irritated and itchy skin caused by the ringworm fungi to get rid of it faster and encourage the healing process. The potency of aloe vera as a natural ringworm treatment can be enhanced by adding some tea tree oil (or other essential oils mentioned above). To make an aloe vera ointment to help reduce the itchiness and scaly skin caused by ringworm, add 2-3 drops of tea tree oil to 1 tablespoon of aloe vera. Apply the home remedy 2-3 times a day to the ringworm patch to help kill off the fungal infection. Colloidal silver can help to get rid of ringworm symptoms thanks to its antifungal effect. In fact, in clinical studies, colloidal silver was just as effective as medications that are used to treat ringworm. Apply the colloidal silver anti-ringworm cream to the affected area 2 times a day to help clear a fungal infection on your skin. You can make a natural ringworm treatment to help eliminate a fungal infection by combining honey, olive oil, and beeswax. Honey is a known antifungal ingredient that is great to heal a number of skin conditions. When it’s combined with the healing power of beeswax and olive oil, it creates a powerful healing ointment for treating ringworm skin infections. You can find out how to make the honey, olive oil, and beeswax treatment for ringworm infections, in my article about the best natural remedies for jock itch. Applying honey is also good for treating other skin conditions such as shingles, cold sores, rosacea and minor burns. Have a good personal hygiene regime and keep your skin clean and dry. Don’t walk in public areas (locker rooms, showers etc.) barefoot. Avoid sharing combs, towels, equipment, and clothing. If your pet has patches of missing hair, take him/her to a vet to check for ringworm. Ringworm usually takes around 2 weeks to clear up. If you still have red, itchy, blister-like bumps on your skin after 2 weeks of treatment, then you should visit your doctor. This is very important, especially if the rash starts to spread and you notice that skin swelling becomes worse and pus starts to form on the infected skin.